Tight joint capsules and abnormal alignment of joints cause muscular imbalances and diminished range. Joint mobilization can be effective in establishing good alignment and increased joint range and therefore muscle length. 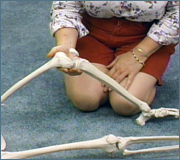 Joint mobilization is an important adjunct to treatment for children with neurological impairment and can provide a more normal mechanical advantage for improved movement and muscle activation. This video presents and clearly demonstrates techniques for mobilization of the joints of the lower extremity and spine.